Construction: The mop handle is made from stainless steel and extends from 42" to 70" which means you can set it to match your height and stop using handles that are too short and force you to bend over to clean properly. The frame is heavy duty aluminum and allows the mop to swivel 360° as well as lay down almost completely flat while keeping the mop in contact with the floor (great for cleaning under the couch!). The Premium Wet Mop Pads are our highest quality wet pad and feature plush loops of microfiber yarn that wraps all the way around to the back of the mop pad allowing you to clean all the way to the base boards. They're also made with a thick foam core that allows the pad to absorb more liquid which means you can cover more area with each pad. 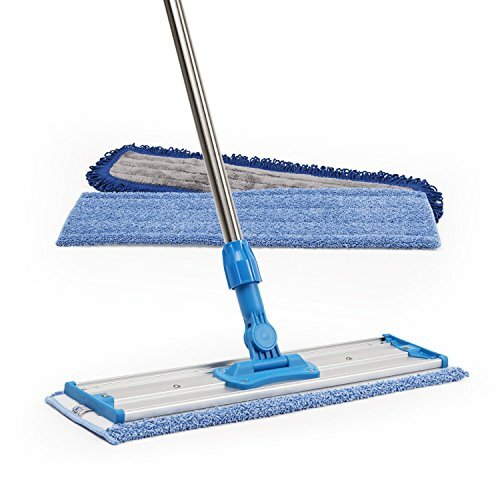 Dust Mop Pad features microfiber fringe yarn that's great at attracting and holding onto larger debris like pet hair and food crumbs while the microfiber in the interior of the mop will collect finer dust particles. If you have any questions about this product by Microfiber Wholesale, contact us by completing and submitting the form below. If you are looking for a specif part number, please include it with your message.